Newer Technology® : News Room : Press Release : NewerTech Announces NuGuard GripStand 3 Multi-Purpose Protective Case and Desktop Stand for iPad 3rd Gen.
NewerTech Announces NuGuard GripStand 3 Multi-Purpose Protective Case and Desktop Stand for iPad 3rd Gen.
July 25, 2012, Woodstock, IL - Newer Technology, Inc. (NewerTech®) http://www.newertech.com, a leading developer of Macintosh®, PC, iPod®, iPhone®, and iPad® performance upgrades and accessories, announced today the NewerTech NuGuard® GripStand® 3 for safer transporting, easier viewing, and more secure handling of the Apple® iPad 3rd Gen. during mobile or desktop use. Available in black, the $34.95 MSRP accessory offers iPad 3rd Gen. owners one of the most flexible and affordable combination protection/viewing solutions available. The NuGuard GripStand 3 is available as a standalone product or as part of a value priced bundle. The bundle includes the GripBase desktop accessory that locks into the GripStand 3 case to provide a fully adjustable viewing angle in landscape or portrait modes along with 360° rotation. The wide, weighted footprint ensures the GripBase will remain stationary on a desk, even in high traffic areas. Like a Multipurpose Tool for The iPad 3rd Gen. The NuGuard GripStand 3 is like a multipurpose tool for the iPad 3rd Gen. The hard plastic protective shell grips the iPad 3rd Gen. snugly while enveloping it in a shock-absorbing inner rubber liner. The removable, skid- resistant desktop stand can be swiveled 360° and positioned at virtually any angle for viewing or typing needs. The desktop stand also doubles as a highly effective, ergonomically designed one-hand grip so the iPad 3rd Gen. can be securely used while standing or walking. For group presentations, the NuGuard GripStand 3 handle can be rotated to use as a hook to hang the iPad 3rd Gen. on the wall in either landscape or portrait orientation. iPad 3rd Gen. users can use the NuGuard GripStand 3 to go mobile with confidence that their investment will be protected. During transport, the desktop stand can be used as a handle to carry the iPad 3rd Gen. like a briefcase. When travel bag space is a consideration, just twist the desktop stand/hand grip to remove it. The NuGuard GripStand 3 also fits seamlessly with Apple's Smart Cover for added protection. With the protective qualities of the case and the sturdiness of the dual-purpose stand and hand grip, the NuGuard GripStand 3 is perfect for the growing use of the iPad 3rd Gen. in K-12 educational environments where the iPad 3rd Gen. will be subjected to unpredictable handling and movement. 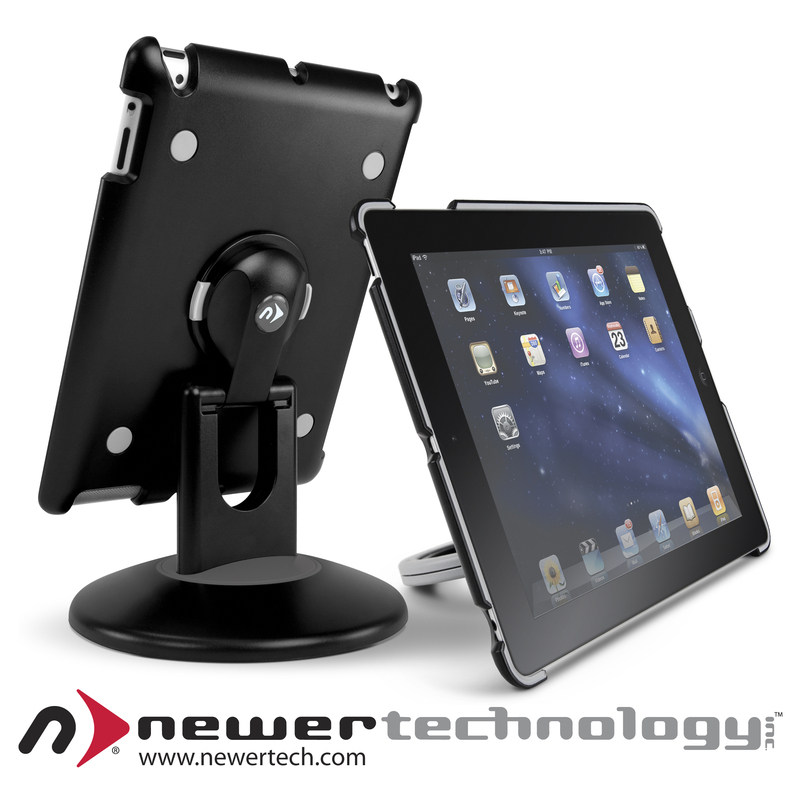 The NuGuard GripStand 3 also includes a nylon strap to securely mount the iPad 3rd Gen. to a vehicle headrest for easy viewing. "The protective benefits and user conveniences of the GripStand and GripBase have been proven by the past two iPad models," said Grant Dahlke, Brand Manager, Newer Technology, Inc. "Both customers and media reviewers have given this product line rave reviews and we expect this latest model to be enthusiastically received as well." Designed specifically for use with NuGuard GripStand protective iPad cases, the Newer Technology GripStand Station allows iPad tablets to slide easily and securely into one of eight bays to store, charge and sync. Combined, the two products create a convenient and affordable Plug and Play storage, charging and syncing solution for classroom, office, retail, healthcare, and other multiple iPad user environments.